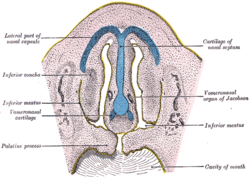 The Jacobson's organ, is part of the body that helps an animal smell things. It is found in many animals. It was discovered by Frederik Ruysch and later by Ludwig Jacobson in 1813. It is also called the vomeronasal organ or VNO. This body part is mainly used to detect pheromones, chemicals that carry information between individuals of the same species. So, sometimes it is called the "sixth sense." This page was last changed on 28 June 2018, at 12:36.